All items will normally be available for collection in our store within the delivery time stated on the store home page (excluding Saturdays and Sundays). Although we endeavour to meet these deadlines for the vast majority of orders placed there can be occasional delays due to forces beyond our control. If a delay in delivery causes you a problem we will cheerfully refund your payment in full or offer you an alternative product. We will endeavour to contact you when the parts come into the store (please enter your mobile telephone number in your account details). 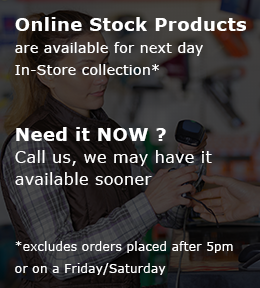 If you have not been contacted within the order time period please call our store to find out if your parts are ready for collection..